by Daniel A. Rodriguez. InterVarsity Press, 2011. Through observation of dynamic Latino congregations, as well as case studies with multigenerational Hispanic churches and predominately Hispanic multiethnic faith communities, Daniel Rodriquez proposes three factors that impact the church in this fast-growing U.S. population. First, the church must be multigenerational serving both an immigrant population as well as the second and third generations born in America. Second, it needs to be multilingual, offering classes, programs, and worship in English as well as in Spanish. Third, it must become multiethnic, reaching out and serving the cultures in the community in which it is location. 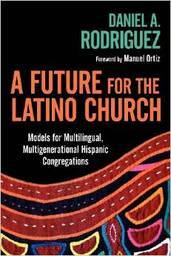 Rodriquez’s message is essential for ministers in communities with large Hispanic populations, for first generation Hispanic pastors who must reach beyond an immigrant population, and for leaders who are challenged to serve the diverse cultures in their communities. Daniel Rodriquez, who holds a Ph.D in Intercultural Studies from Fuller Theological Seminary, teaches Religion and Hispanic Studies at Pepperdine University.